The Perry Low Leg Queen Comfort Sleeper is a new transitional design from industry leading manufacturer American Leather. The Perry features sloped arms, tasteful wooden legs and the patented 24/7 Tiffany Sleep System. The Tiffany’s unique mechanism contains no bars or springs, ensuring a comfortable night’s sleep for you or your guests. 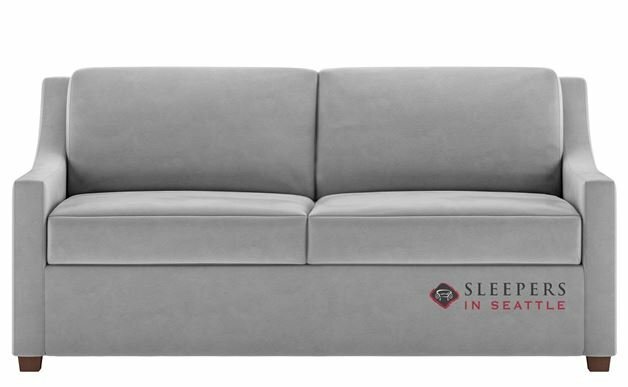 As a new Generation VIII Comfort Sleeper, the Perry features more streamlined design, eliminating the velcro and tuck in rolls found in previous models. Color matched flaps are now replaced with UV printing. The Perry is available in seven sizes, three mattress types and numerous designer fabrics. What’s the hold up? Add this terrific sleep solution to your home now!